Open one pizza crust and roll it out lightly on a floured surface to a 14-inch circle. Transfer the dough to a deep-dish oven-safe skillet (cast iron works best). Work the dough up the sides of the skillet. Sprinkle half of the grated cheese in the crust and top with the leftover pasta. Then season the pasta with salt and pepper and top with remainder of the cheese. Roll out second pizza dough and cover the skillet with the dough. Crimp the edges to seal in the filling and make a crust. Use a serrated knife to cut a few holes in the top so steam can escape. Bake deep-dish pizza for 30 minutes until the edges are a deep golden brown and the center is cooked through. Let pizza cool for 5 minutes before slicing and serving in big wedges. 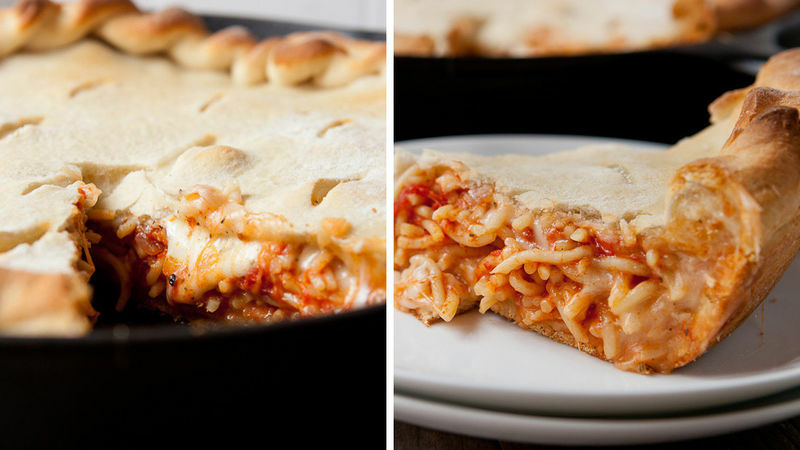 Load up leftover pasta and sauce between two crusts and bake. That's it! As far as I can tell (in my many years of cooking), it’s impossible to prepare the correct amount of pasta. There’s always too much or not enough. I think we can all agree that not enough would be terrible, so I always end up with too much. Leftover spaghetti can be a bit boring on its own, so I like to try and make something else out of it. This was my most recent creation: A deep dish pizza STUFFED with spaghetti! If you think about it, it makes total sense. Pasta sauce is pretty close to pizza sauce and when it’s baked in a double crust pizza with lots of gooey cheese, you won’t even think it’s leftovers! You could use any leftover pasta for this, really, but a pasta with red sauce works really well since it’s closest to pizza sauce. Start by rolling out one of your pizza doughs and mold it into your deep dish skillet. I used a 12-inch cast iron skillet and it worked perfectly. Then layer in about half of your grated mozzarella cheese. Then it’s time to pile on the spaghetti! About 1/2 pound of leftover pasta should be enough to fill your pie. Then add more cheese over the spaghetti, and add the top piece of dough. Be sure to crimp the edges of the dough to form a crust and cut a few holes in the top crust so steam can escape. Bake the deep dish pizza for about 30 minutes at 375ºF, until the edges are a deep golden brown and the center is cooked through. This will be really hot when it comes out of the oven, so let it cool for a few minutes before cutting into it. Each slice will have gooey cheese, a crispy pizza crust, and a warm spaghetti filling! Nick feels like carbo-loading! Check out his blog, Macheesmo, and follow him on his Tablespoon Profile.